Bergerac is both a town and a gorgeous wine producing area located just a hop, skip and a jump from Bordeaux’s right bank. Cultivating vines for wines since Ancient Roman times and exporting wines to England since the 13th century, Bergerac has long been overshadowed by its neighbor Bordeaux. However, there are some gems in this region that are well worth spending a day out in the wine country discovering. That’s where we come in! We have designed this one-day wine tasting tour as an excursion from Bergerac, Saint-Emilion or Bordeaux. You will have your own private driver, so you can enjoy the wines without having to worry about driving. Visit three beautiful estates, meet the owners and winemakers and taste a wide array of wines including sweets, dry reds, whites, and rosés. For lunch, a romantic wine picnic will be organized on a wine estate, overlooking the vines. This is a terrific day out for wine lovers visiting the Southwest of France looking to explore beyond Bordeaux. Your friendly driver and luxurious Mercedes will arrive at your hotel or villa (in Bergerac, St Emilion or Bordeaux) this morning and sweep you away to the enchanting Bergerac wine country. Arrive at the first estate of the day, Château Masburel, one of our favorites in the southwest. Learn about Bergerac’s confusing appellations (13 of them- Bergerac Red and Rosé, Saussignac, Monbazillac, Pécharmant, Rosette, Bergerac Dry White, Bergerac Sweet White, Côtes de Bergerac White, Côtes de Bergerac Red, Montravel, Haut Montravel, Côtes de Montravel and Montravel Red!!) and take in the divine views of the vineyards with your animated, charming host. Carry on with a tasting of five of their best wines. Next up is a visit to a super friendly count’s spectacular vineyard at Château Bélingard. The Comte de Bosredon is the most unassuming, modest count you are likely to ever meet, and a delightful character. He will cheerfully tell you about local history and lore including the hundred years’ war, ancient druid virgins, and his family’s role in the area. This is a treat. 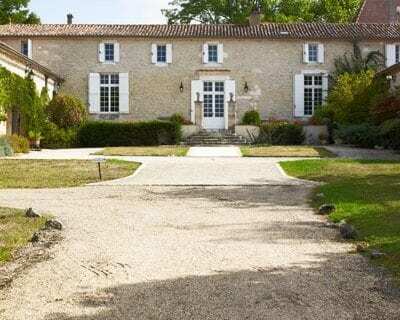 His estate is the most picturesque in the Bergerac area with grapevines clinging to the gentle hills and a fine Château at the highest peak of the property. After a visit to the cellars, you will taste a selection of flagship Bélingard wines. Finish the rest of your favorite bottle over a cozy picnic near an ancient Druid site on the estate, facing the vineyards and handsome oak trees. Sit back, relax and enjoy local cheeses, freshly baked pan, Basque marinated peppers, gourmet Terrine, Foie Gras, and Salade Niçoise. Before heading back to your hotel or villa, you have one last stop to make. David Fourtout’s Les Verdots wine estate is possibly the best in the entire region and you will be privy to a private tour with the talented winemaker himself. This is a great way to finish your wine tour in Bergerac. We hope you had a fabulous day out.